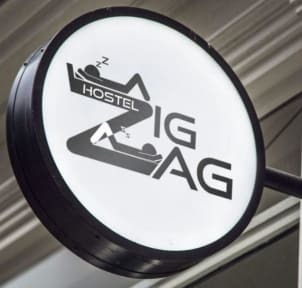 Zig Zag Hostel facilities provide comfy and homelike environment for travellers. Enjoy common areas such as TV room, terrace, 'patio' and shared kitchen. We also have plenty of books, hot water showers and strong wifi. Profits goes for charity events where all guests are invited to participate. Our location is pretty good for the traveller. We are barely 5 minutes walking from the ruins Huaca Pucllana. In addition, there are several leaisure places and restaurants near to our locations , such as Migraciones - Sótano del Ovalo Gutiérrez, Bodega de la Trattoria, Parque Kennedy and Museo de los Vecinos, among other relevant places for the traveller. Furthermore, city center is quite reachable by public transport and it is around 30-45 minutes away from our hostel. Our accommodation facilities are economic but at the same time cozy, warm and with great quality. In addition, since we are a hostel, we take care of the social sphere of it, so that is why we have several common areas where the guests can relax and chat among themselves. Zig Zag Hostel Policies and Conditions. The reception is open from 07.00. One of the best hostels I've ever stayed at! Perfectly located at Miraflores and not far from the Barranco neighborhood. Nice rooms and very good breakfast. But above all, the staff is awesome! Thank you for making my stay so wonderful! Really enjoyed our stay here. Very genuine people and really love he charitable aspect of this hostel. Safe and comfortable neighborhood. Staff were very friendly and accommodating. Excellent hostel just next to Miraflores' archeological site Huaca Pucllana. They serve great breakfast. The hostel also runs a charity by giving food to children from poor families every Saturday - hostel guests are welcome to participate. It is true they have a great breakfast with eggs! Very rare. I have stayed twice at Zig Zag and both times I was very happy with the atmoshpere, the kitchen and staff :) the staff are very friendly, easy to talk to and informative. Wonderful little hostel in a nice location. Only stayed for one night - the breakfast was good and the staff was helpful! Peaceful hostel, the bed was ok and the bathroom/shower too, well equipped kitchen, breakfast could be good but acceptable. Nice and quiet location. If you are in transit in Peru as I was, it can be a good option for a couple of nights. Great hostel and location. Good cause. Showers are not hot very often. Kitchen is not great also. Blunt knifes and stove doesnt work properly. Apart from that great time here. We only stayed in this hostel for one night so that might not be enough to review it fairly... We arrived lte at night, the staff was friendly and helpful but the bathrooms were quite in a state and very dirty! I only stayed for one night, but overall I wasn't impressed. Bathrooms were disgusting, staff were blah except for one, breakfast mediocre. I would recommend staying somewhere else in Miraflores than here. It wasn't worth the money to me. The morning staff was very helpful with finding transportation though! Booked for two nights. Left after one with only a partial refund. Confusion with what bed people were supposed to be in which woke us up. Also one staff member came in multiple times between 2/3am to talk and laugh with a person in our room. Hostel set-up was fine but wouldn’t recommend staying there.